This colourful paper turkey craft is such an easy turkey themed craft for kids, especially if you use our turkey template! 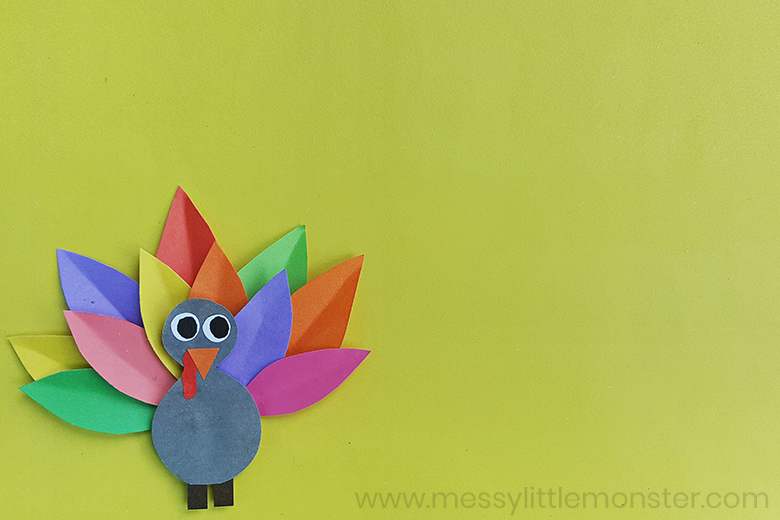 This will easily become one of your favorite Thanksgiving crafts for kids. Children can even write what they are thankful for on each of the turkeys's feathers! 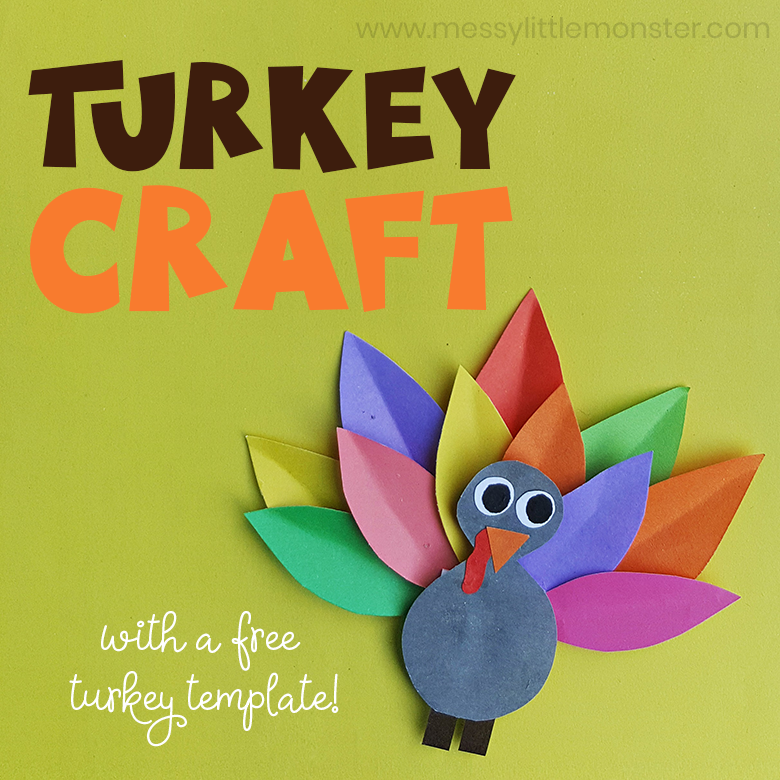 Just follow the step by step directions below to make your own paper turkey craft! If you're looking for more Thanksgiving activities for kids, they will love to help with this pretzel turkey snack! 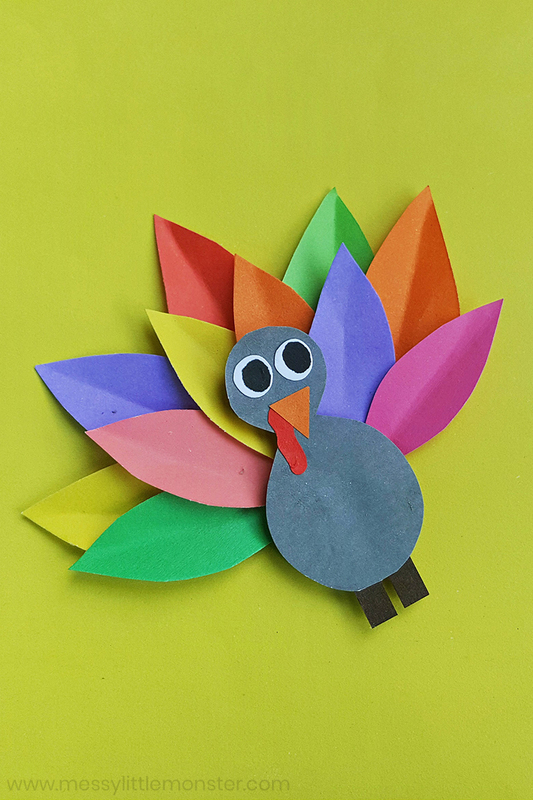 This paper turkey craft is PERFECT for using in the classroom, on playdates or even for keeping little ones occupied during Thanksgiving dinners with family. They will LOVE playing with their paper turkeys and I love the idea of writing what they are thankful for on each of the feathers! 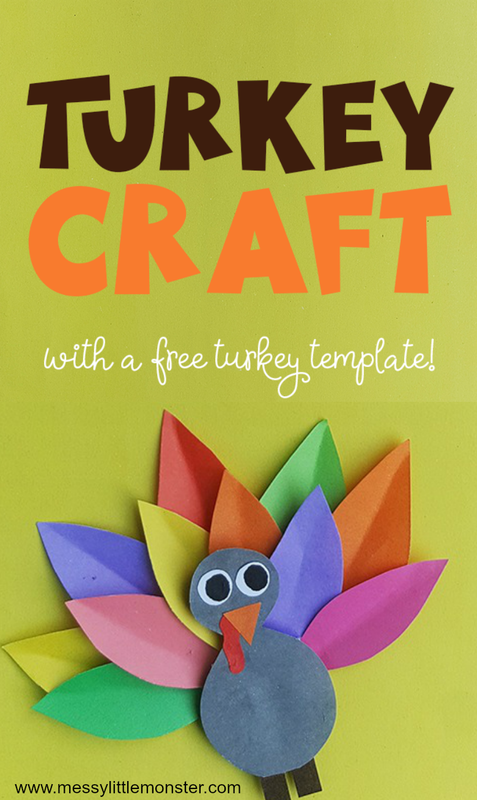 Just scroll down below for full instructions to make your very own turkey craft with the free turkey template. SCROLL DOWN FOR THE FREE TURKEY TEMPLATE! 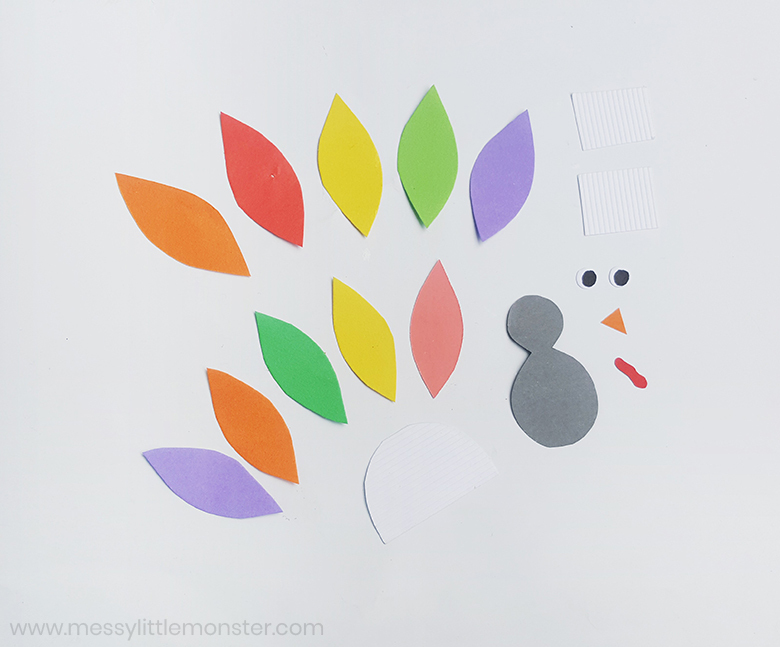 Before you get started with your paper turkey craft, be sure to gather up all the supplies! If you are doing this turkey craft with younger preschoolers and toddlers you may want to precut some of the shapes for them. 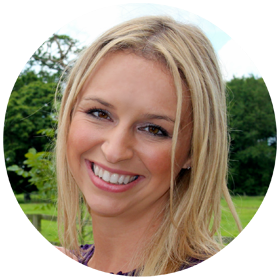 You will need the turkey template which you can download at the bottom of the page. Once you have your turkey template downloaded and printed out, it's time to cut out all the shapes! 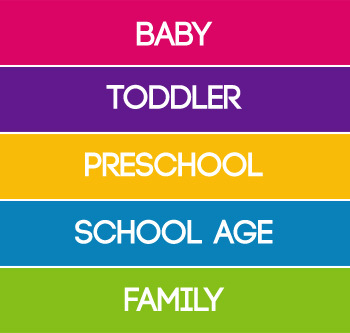 Toddler and preschoolers will love helping to pick out the colours they want. Just trace the shapes with a pencil onto the desired coloured papers and then use scissors to cut them out! The piece that looks like a small circle on top of a larger circle will become your turkeys body. Glue all of your turkeys features onto his body as shown in the picture below. Then, use a black sharpie to draw eyes on the two round shapes to create eyes. Your turkey body is now complete! Now it's time for the turkey feathers! The colourful leaf shaped pieces will become your turkeys feathers. Make a crease along the middle of each feather lengthwise to give a 3D appearance. Arrange the larger feathers in an arched shape by glueing them along the edge of the semi circle. Then arrange the smaller feathers on top of the large ones to create a second layer of feathers as shown in the picture below. 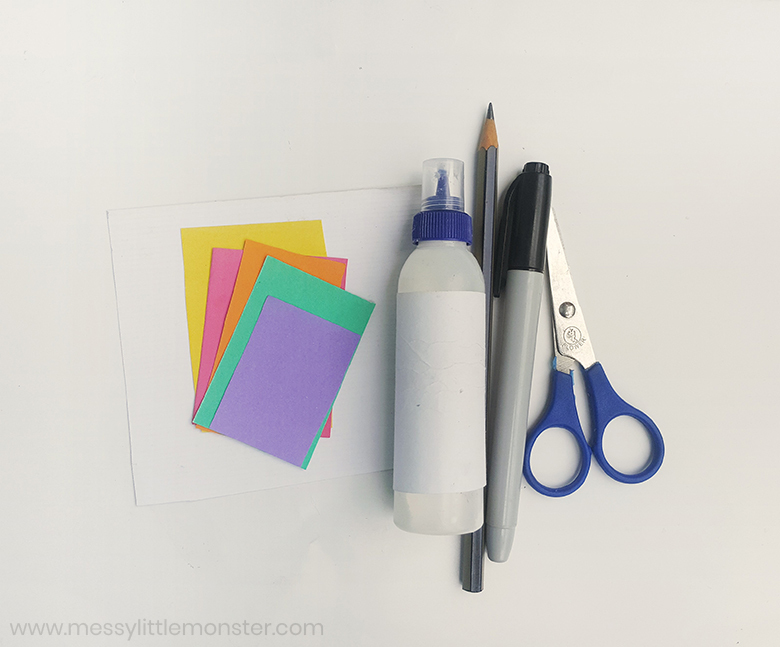 Prepare a few pieces of cardstock and glue them all together. Then place them at the end of the feather arrangement and glue it into place as shown below. This will help to create a 3D look and make it look like the turkey's body is infront of the feathers. We're almost done! Apply some glue on the cardstock and attach the turkey's body. Optionally, you can cut out some square shapes to create turkey legs and glue them to the bottom of the turkey body. Now just wait for it to dry! 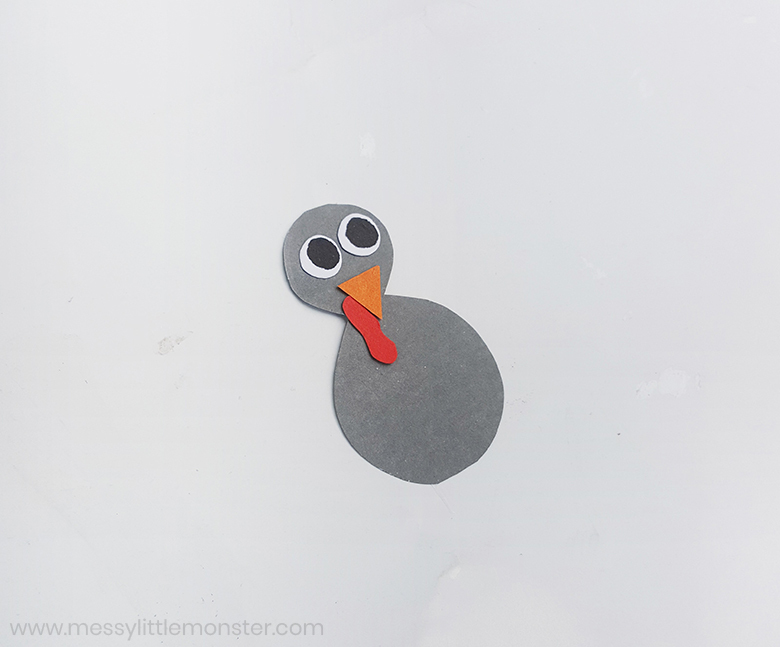 Once dry why not add a craft stick to turn your turkey craft into a puppet? Or if you are making this turkey craft for Thanksgiving it would be fun to write what you are thankful for on the turkey's feathers. 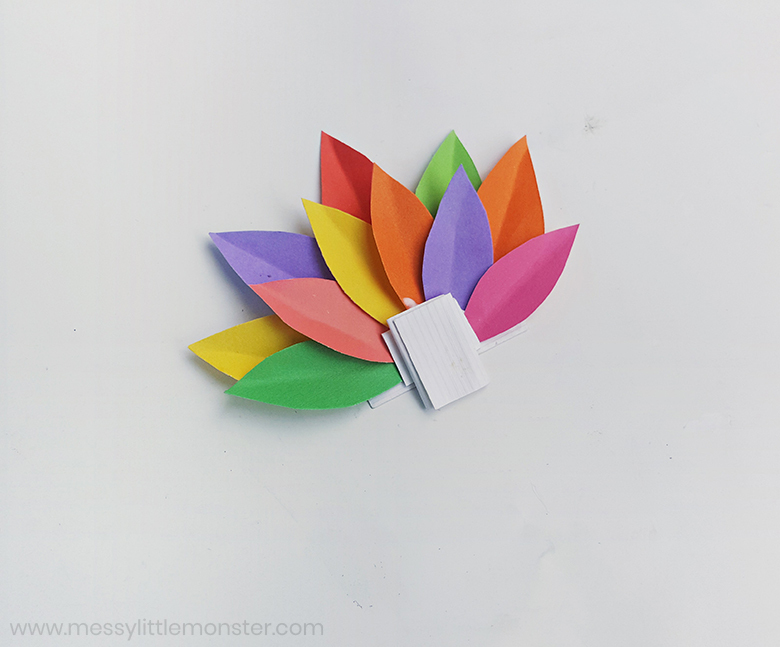 For an added bonus, you could add a fun turkey themed book to go with your paper turkey craft. One of our favorites is There was an Old Lady Who Swallowed a Turkey! As you make this turkey craft you have a great opportunity to introduce and discuss Thanksgiving traditions with your children. To download this turkey template for free add $0 and click on the 'I want this' box below. It may take a moment for the page to load so please be patient. For personal or classroom use only. Not for redistribution. All images are copyrighted. 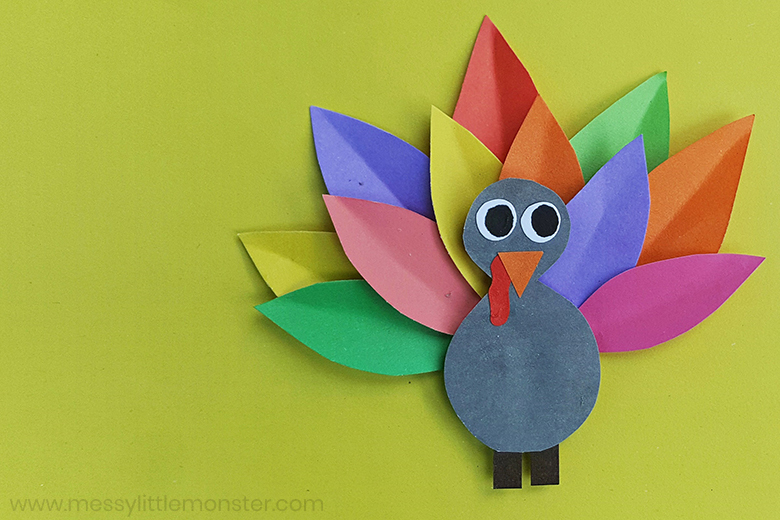 Kids will LOVE this fun paper turkey craft! 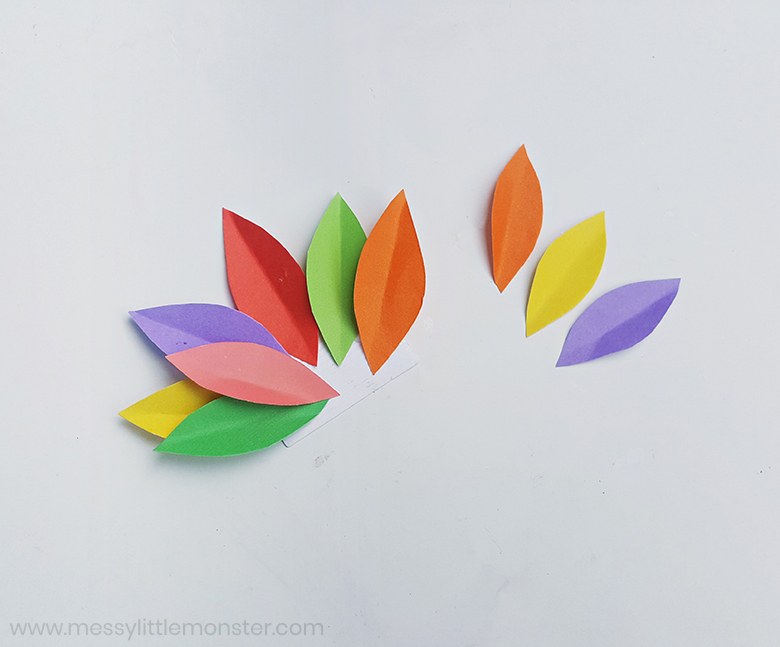 It's one of our favorite Thanksgiving crafts for kids at this time of year. 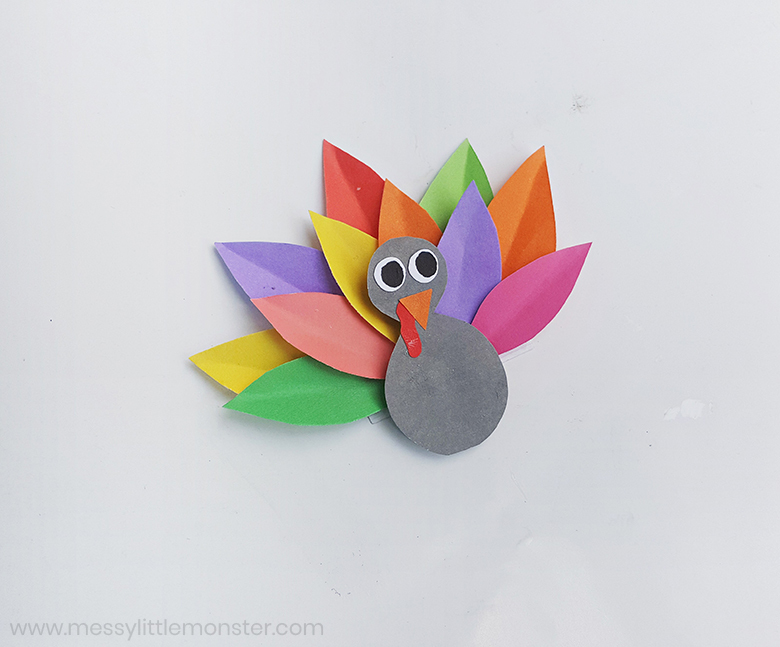 With the turkey template, it makes a fun and easy turkey craft to do with your toddlers and preschoolers.